I don't often get to shoot around Olympia area, but I'm always so excited when I get a chance to be out that way. I grew up with family in Gray's Harbor and Olympia was often the meeting point or break stop along the way. It's safe to say Olympia has a special place in my heart. When Brooke decided to do her shoot out in Oly, I had two things on my mind: 1. I love Olympia! 2. Olympia Coffee Roasters... gimme. You can imagine how ecstatic I was when she wanted photos inside the coffee shop... yuuussss. If you want a shoot with variety, look no further than Olympia. This is the perfect mix of trees, PNW beach, and small-town urban. 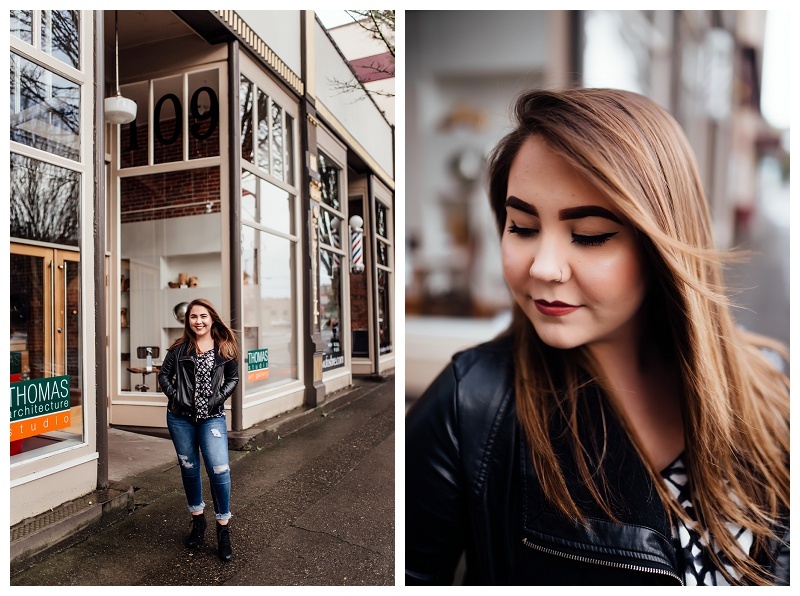 I say "small town" because if you have been to downtown Olympia, you know it has that vibe. It's a very artsy feeling city that's a bit gritty, but I love it nonetheless. Speaking of having a special place in my heart- enter Brooke. Brooke is on my class of 2017 Britt Key Team and I've had a little over a year to get to know this sweet & sassy girl. I love a girl with her own mind and opinions. From the beginning of her time in the Key Team, Brooke has been committed to attending every event she could and has been welcoming and chatty with new members. I can count on her to include those that are a little shy, to step up when others need help, and she makes a darn good shoot assistant! Partially dark, we headed to our first location to the beach to meet the "rising sun" (read: clouds). 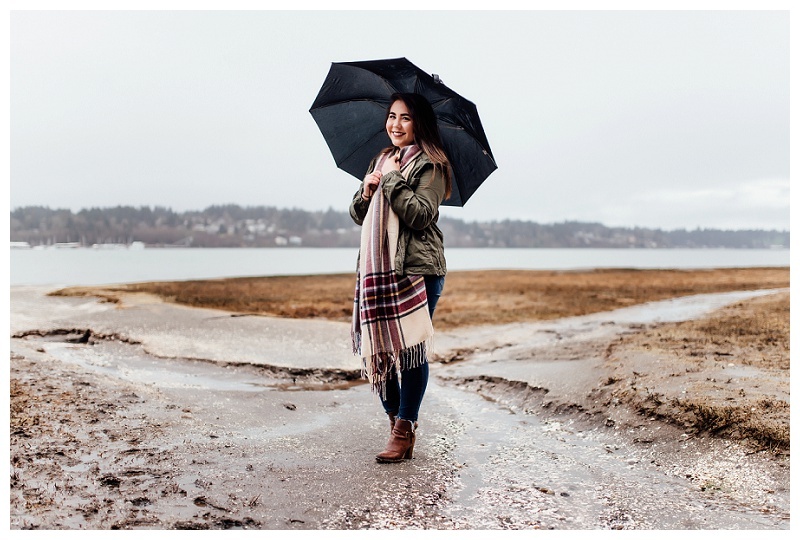 The drizzle had us a bit worried for most of the shoot, but we were able to work with it, and even had a few fun umbrella shots. Peaceful and salty, the beach was a perfect place to start. I always love to begin a session in locations that are less busy, so my clients have a chance to relax and get comfortable at the beginning of a shoot without strangers watching. Once we finished at the beach, we headed downtown and then to Olympia Coffee Roasters. OCR kindly let us capture a few shots inside. It was a bit of an adventurous morning, but it was worth it! 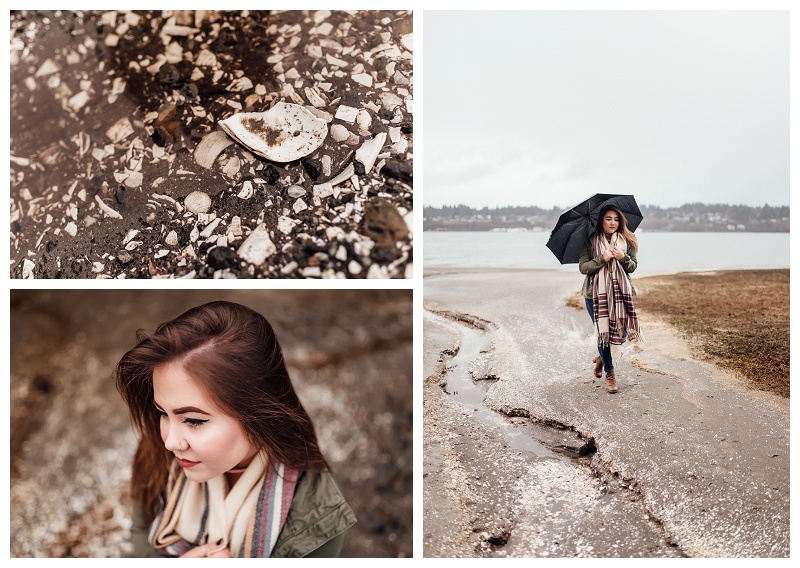 Thank you to Brooke for always going with the flow and picking such a cool location!